I have Fontawesome and Powerline both installed through Portage. But for some reason, I cannot get URXVT (Or any other terminal emulator) to play nicely with icons. What am I missing? as the lack of UTF-8 is going to be responsible for this. Squares are urxvt problem only. You can try with other terminal. I've tried building from your repo and now it's back to the A circumflex. this happens in Xterm and URXVT. outputs that everything is utf-8. Try with different font then, I can tell you what I'm using, also if you have "URxvt.letterSpace" in your config delete it. I mentioned just the locale since that was something I had to correct on a machine recently, and it was the only part of the puzzle that was missing. I use urxvt with a powerline patched font and it does work, so I'll nominate some of my options that may help you reach a solution. 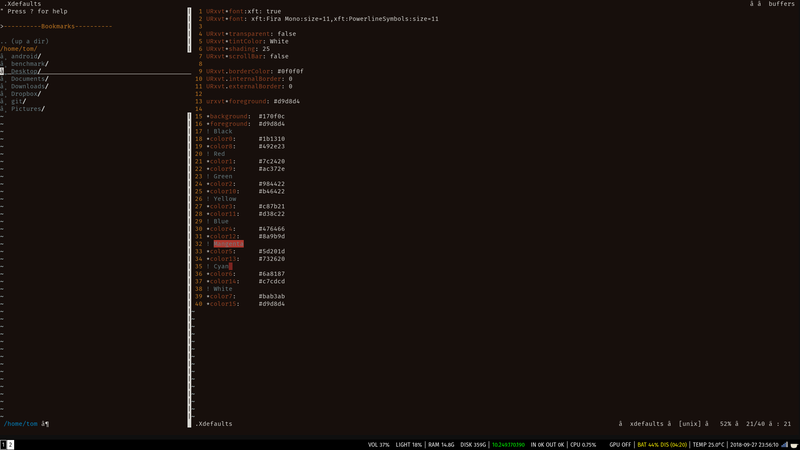 [ebuild R ] x11-terms/rxvt-unicode-9.21::gentoo USE="256-color focused-urgency font-styles mousewheel perl pixbuf startup-notification unicode3 wcwidth xft -alt-font-width -blink -buffer-on-clear -fading-colors -iso14755 -secondary-wheel -vanilla"
to expedite testing new changes to .Xresources. I do not have any patches in the build process that aren't already pulled in by the ebuild/portage. All my locale env values are ja_JP.UTF-8 but any of the UTF-8's should do it. I'm using a handful of the popular powerline glyphs, including the gentoo logo itself thanks to the nerd font I'm using on the shell just fine, so rest assured it can be done. @kitsunenokenja, have you tried the same settings with the latest 9.22 version ? Some USE flags are dropped. Haven't tried it yet since it's still marked unstable. Did upstream make worthwhile changes since last release? I started using rxvt since 9.22 so I can't answer your question, but I guess they did.